You will be invited to enjoy a spectacular view of miles and miles of Atlantic Ocean when you reserve a North Myrtle Beach vacation rental at Oceans, a North Myrtle Beach resort in the Cherry Grove section of North Myrtle Beach, South Carolina. This North Myrtle Beach resort is just a few blocks north of Sea Mountain Highway, near 25th Avenue North and Ocean Boulevard. It is a North Myrtle Beach resort that is right on the oceanfront! Oceans is a uniquely designed North Myrtle Beach resort in that it is eight stories of North Myrtle Beach condominiums built atop a three-story parking garage. 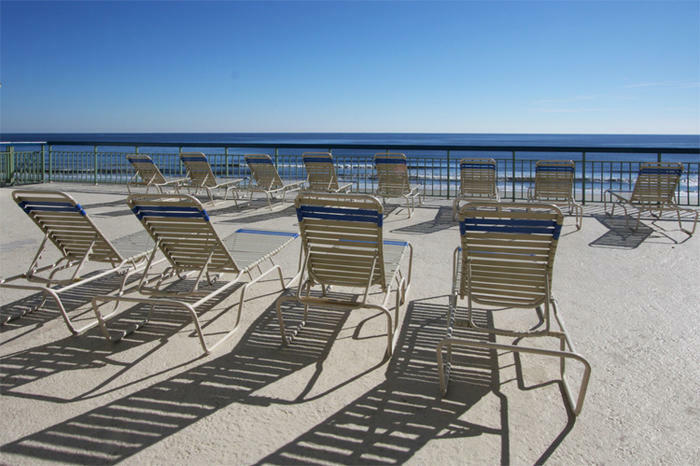 All of the North Myrtle Beach condominiums at Oceans have direct oceanfront views from the private balconies. Each of the private balconies at this North Myrtle Beach resort also has a view of the oceanfront swimming pool. The pool area and sun deck at Oceans North Myrtle Beach resort are on the fourth floor. With centrally located elevators and stairs on both ends of this North Myrtle Beach resort guests from throughout the building can quickly reach the fourth-floor pool deck. There are so many North Myrtle Beach vacation rentals at Oceans from which you can choose. Each one is a little different from its next door neighbor and the furnishings might vary from North Myrtle Beach condo to North Myrtle Beach condo at Oceans. So you can really tailor your North Myrtle Beach vacation plans to meet your family’s specific needs and wants. There are two North Myrtle Beach condo rental sizes at Oceans. Choose between a one-bedroom, one-and-one-half-bath North Myrtle Beach rental and a two-bedroom, two-bath North Myrtle Beach condominium. The larger, two-bedroom North Myrtle Beach vacation rentals at Oceans can sleep six, seven, eight or 10 people, depending on which North Myrtle Beach condo you choose. The smaller, one-bedroom North Myrtle Beach condominiums sleep four or five and are ideal for a family with children. All of these condos in North Myrtle Beach, South Carolina have a fully furnished kitchen that boasts among its appliances a dishwasher. Most of these North Myrtle Beach rentals have at least one DVD player and most of them feature a sleeper sofa in the living room. Some of these North Myrtle Beach rentals boast a Jacuzzi tub, which offers terrific relaxation after a day of shopping the outlet malls or playing 18 holes of Myrtle Beach golf. This might be an important amenity to include in your North Myrtle Beach rental. Elliott Beach Rentals is not affiliated with onsite management or the HOA of Oceans.